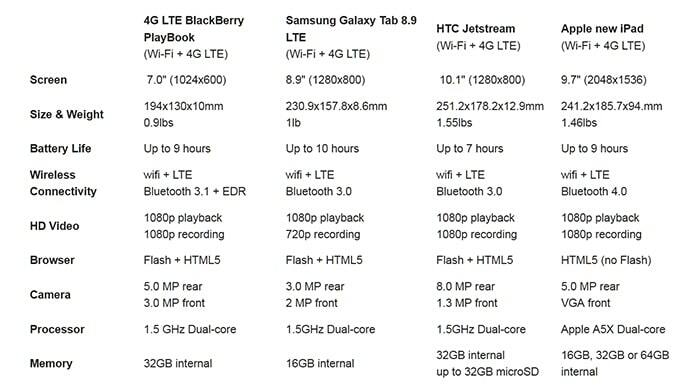 One of the recent developments in the tablet sphere is the launch of the LTE version of the PlayBook. The 4G compatible RIM tablet came in almost unnoticed, perhaps because it arrived over a year since RIM had first announced it was in development. In the last year, quad core CPU’s and high resolution displays have become associated with tablet devices, and the late introduction of the LTE Playbook prevented it from keeping up with the times. In view of the recent launches that we have seen, as well as a few more upcoming devices, the PlayBook does seem to be from a bygone era. At least the tablet in itself is a step ahead of its 3G counterpart. However, depending on your tablet needs, it can be worth comparing the PlayBook 4G to many of the tablets currently available, including even the chart topper iPad 3. First things first, the PlayBook 4G is almost the same device that RIM had launched in 2011, but has an upgraded CPU and the ability to connect to 4G and LTE networks. This makes the device a bit more up to date than the older WIFI model, though its makers may have goofed things up on the pricing again. The 32 GB version of the tablet is priced at $549 without any carrier contract, which makes one wonder if there will be many takers for it. Also, is 4G capability along with a more powerful processor (1.5 Ghz Dual-core chip against 1 Ghz for theWIFI PlayBook) worth the quite hefty price tag? For comparison’s sake, the 4G iPad 3 with 32 GB storage will cost $729, though that is a vastly better device with the best display, better processing capability, and a comprehensive tablet app ecosystem. The Galaxy Tab 8.9 is cheaper at $470 in spite of featuring a bigger and better display while also owing allegiance to a better ecosystem. Or if you would like to be in the vicinity of a 7 inch display, the Galaxy Tab 7.7 LTE is also cheaper at $499. Coming back to PlayBook and its 4G capability, the tablet does pack a punch here and delivers good download and upload speeds. 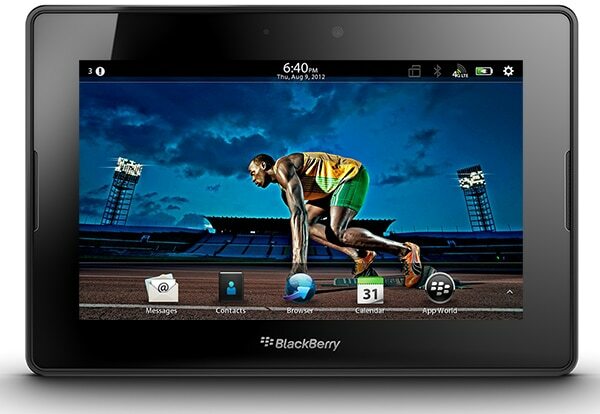 Couple that to its improved processing capabilities and what you have is a tablet that boasts of speedy performance. About its OS, the PlayBook 4G is exactly identical with its stable mates by running the PlayBook OS 2.0 that had brought some degree of respectability to the tablet. This has enabled the tablet to run some Android apps. While that does add to the tablet’s appeal, the PlayBook, or for that matter RIM, is still way behind its competitors as far as availability of apps is concerned. Android and iOS is far better on this, while Windows 8 is catching up fast. Externally, the PlayBook 4G is the same as its other version except for a micro SIM card slot that is housed at the base where the ports are located. The PlayBook 4G also has 9 hours of battery backup times, which again puts it in the league of the iPad. Overall, the PlayBook 4G isn’t the most advanced 4G tablet that your hard earned money can buy right now, though it still has its pluses. It boasts of a solid build quality, fluid multi-tasking, good performance, and acceptable battery life. However, the one thing that PlayBook lacks the most is the availability of quality apps, and as a result users don’t have a lot of options with the function of the device. How many apps do you need? 100,000? Future shop, Telus, bell – none had the lte today – Where can you buy it? 1. There never was a 3G playbook. Did you do any research before writing this? 2. Quality of apps on Blackberry world is higher than Android and Apple. There are not zippo lighter apps. The Playbook has pretty much all the Apps most people are looking for, and it’s getting better at an exponential rate. QNX OS simply destroys then runs circles around that ancient Java crippled IOS software of Apples. Dude, The Playbook LTE simply runs circles around all other tablets period, I suspect that as a tech blogger, you probably haven’t touched one at all let alone used it for an extended period of time.